One of the challenging and rewarding aspects of managing a piece of property is the fact that we are working with and trying to manipulate a multitude of living organisms. If you think of the entire property as one living, breathing entity, the irrigation system is very much the cardiovascular system, supplying life sustaining water throughout the course. In our bodies we have veins and arteries that run blood throughout our bodies supplied by a central pump, the heart. On the course we have pipes and sprinklers that supply the water to the turf and at the center of it all are our pumps and wells. In the human body, if the heart stops pumping blood death is soon to follow. Similarly, if the pumps stop water to the course during the summer, turf dies. Flow testing in the fall. So, to make sure that the system stays running in tip top shape, we bring a specialist out to test the heart of our irrigation system much like you do when you go for your annual physical. At TPCC we have two wells that supply water to the system. Every other year we flow test both to ensure the production levels remain adequate. 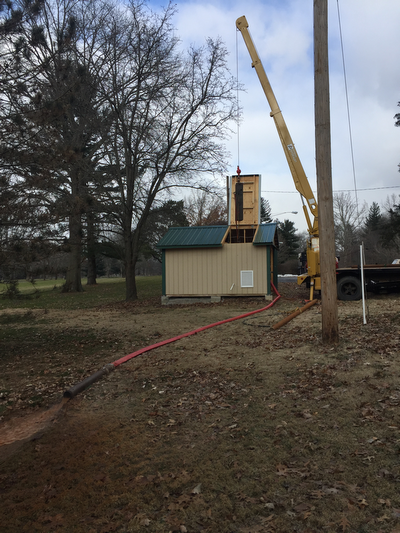 To do this, a crane is brought in to lift and rotate the pump so that it can be run for a set amount of time while discharging the water out onto the ground. The height of the water is measured before and after the pump is run. This measurement is termed "draw down" and is measured in Gallons per Minute per Foot. Excessive draw down suggests that there are issues with the well and that it needs to be cleaned. This year, the well closest to the 9th hole putting green showed a sharp drop in the production levels suggesting the well needed to be cleaned. 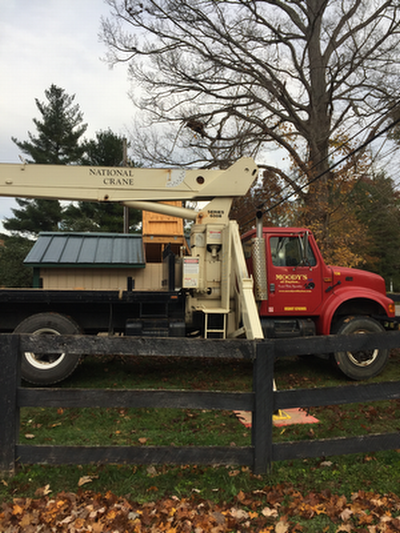 Crane used to lift pump out of well. Before the cleaning process can begin the entire pump system needs to be removed to allow access to the well itself. Our wells go down almost 90’ with the pump reaching down over 60’. As you can imagine this is no easy task. The pump consists of an electric motor that sits above the well. 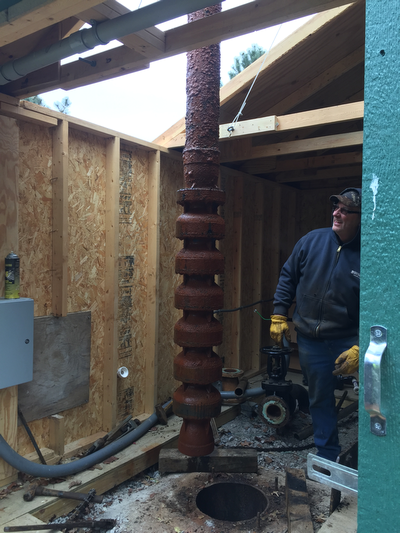 A large shaft resides in the middle of a column pipe in 10’ sections. To remove the pump a crane is brought in and the pump is slowly lifted out in sections. This is a slow and tedious process as much care is taken to ensure nothing falls back down the well, causing major issues. Once the pump is removed each part is inspected back at the shop and any necessary repairs to the pump are made. 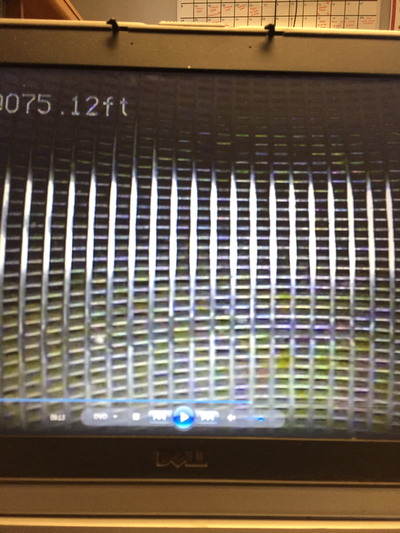 A video is made of the well prior to cleaning to document the condition of the well and screening. This is to ensure that there are no serious repairs needed to be done prior to cleaning. 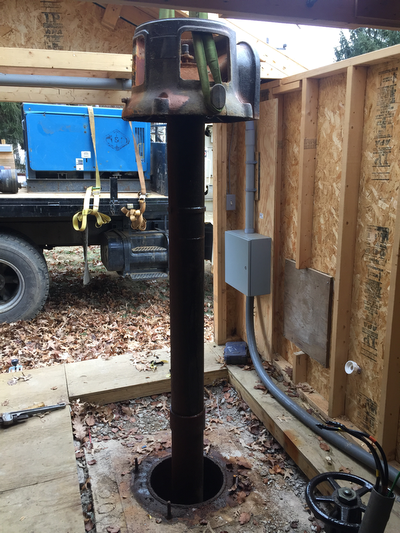 Discharge head at the top of column pipes. Pump being removed from 70' below. Finally the wells are ready to be cleaned. To begin, a blasting charge is dropped down into the well and detonated to free up all the buildup on the screens. 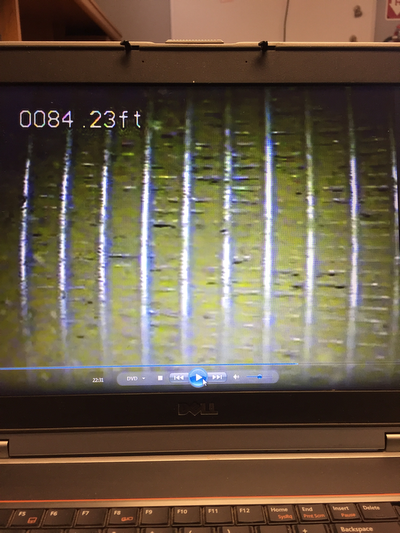 Once the charges have been set off, acids are pumped into the well to assist in the cleaning process and the well is purged of all the sediment and debris for 50 hours! This returns the well back to the original operating specifications. Sediment and debris being flushed out of well. After the cleaning has been performed another video is made to inspect the work and ensure that the cleaning was successful. 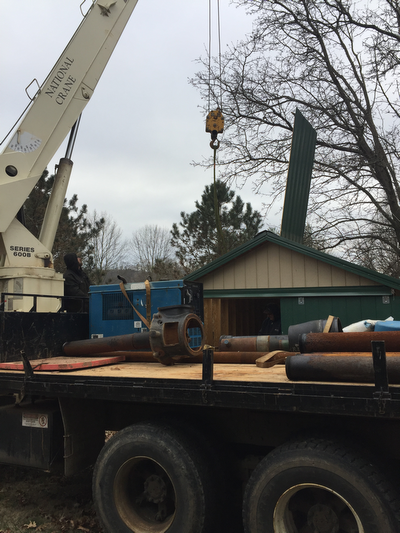 The pump is then reinstalled and reconnected to the irrigation system and put back into operation ensuring that the water keeps flowing throughout the season. Well screen before cleaning. Well Screen after cleaning. As you can see, the scope of work involved with cleaning is much more than one would imagine. Thankfully wells can go for multiple years without needing any work performed. For instance, the last time this well was cleaned was back in 2011 and when you think about how much use each well gets, you can really see that it is well worth the investment to keep the system in good health with regular checkups and preventative care, just like your own body!